The Great Peanut Butter Emergency of late winter 2014 (see my original post here) got me started on making my own peanut butter. As promised, I continued experimenting with that original recipe; with the changes I’ve made, it now rivals my favorite store-bought brand in texture and spreadability (go to the revised recipe here). In terms of flavor, IMHO, it’s better! Fresh, warm peanut butter (think fresh-baked bread), with its heady aromas, delicious flavors, and exceptional mouth-feel, is so good! It’s a 3-D movie compared to its stick-figure flipbook of a store-bought cousin. She ought to have a blog. The secret to great homemade peanut butter is in roasting the nuts, grinding them while they’re still piping hot, and then processing them until they’re whipped. In the spirit of complete transparency, the DD prefers the flavor of the PB without additional roasting. 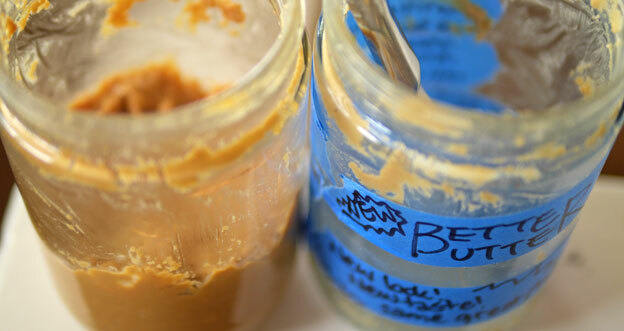 The image of the (empty) jar of “Better Butter” peanut butter at the top of the post is one that she made and labeled. In my rival marketing campaign, I’m calling my peanut butter “Bestest Butter.” She likes a mellower flavor so that she can really pile it on, but I like the full-bodied flavor and darker color that additional roasting brings out. Of course, the beauty of homemade is that if you like a mild-tasting PB, you can skip the additional roasting and simply grind the peanuts as described in the recipe. Which do you prefer? The lighter original or the robust revised version? This entry was posted in Musings on July 24, 2014 by sandra. If you could replace some or all your food with a nutritionally balanced drink, would you? Maybe you’re too busy, or you just don’t feel like cooking. Maybe you’re on a tight budget. Instead of filling up at the Golden Arches, grabbing chips or an energy bar, or nuking up a frozen entrée, you could sip on something healthful, filling, and easy to make instead. And when it was a good time for you, you could go ahead and have a nice meal. Sound appealing? There’s already a product that claims to meet this need: Soylent. But before you run out and buy Soylent (though actually, you’d just click the “Buy Now!” button on your browser and then wait for the UPS truck) or pull out your lab kit to mix some up based on the original recipe, made available by Soylent’s creators, take a few moments to consider the flip side. A steady diet of Soylent is thought by many to be downright boring, and is acknowledged even by its proponents as unapologetically functional. Many users also report serious problems with gas — though this is supposed to, if you’ll excuse the pun, pass after a week. Also, no long-term scientific studies have been conducted to test its claimed benefits, or even its basic safety. Soylent didn’t create the problem of lives that are so busy that eating (never mind cooking!) becomes a chore satisfied with whatever might be convenient and crammed into the spare minutes in between commitments. As you might expect from a Cozy Foodie, I prefer the ideal of cherishing these necessary pauses in the day, but at least Soylent is trying to ameliorate the problem by making sure that we get adequate nutrition. However, I worry that a product like Soylent will exacerbate the problem because it makes it that much easier to skip meals. Superficially, test tube nutrition may look appealing. People can get adequate nutrition at a relatively low cost, at the same time sidestepping the problems of a diet of hyper-processed food products and of contemporary industrial agriculture: pollution, water waste, overuse of antibiotics, and superbugs. But it remains to be seen whether test tube nutrition is yet another technological fix with unforeseen consequences in a long line of supposed solutions for the basic problem of how to feed the hungry. For example, the industrial model of agriculture led to monocultures which led to pest infestations that destroyed entire crops. Chemical pesticides were created to counter these pests, but pesticide-resistant pests evolved, leading to the need for ever-more toxic pesticides and genetically modified plants that can withstand the pesticides. I won’t recount all of the problems of industrial agriculture here, but knowing this history, we should study the costs and imagine the consequences of advocating the widespread use of test tube nutrition. First and foremost, we don’t really know enough about nutrition to know what is optimal, and eating a wide variety of foods may be better than taking in only a limited, pre-defined panel of nutrients. Supporters of Soylent assert the obverse: that people don’t know if they are getting optimal nutrition even by eating a wide variety of foods, and that by using the scientific method for formulating new iterations of Soylent, people can hone in on what we need to function at our best. Regardless, even in its current iteration, Soylent may still be a better alternative compared to a diet consisting primarily of McFood. And there are also limits to arguing that we should eat what humans evolved to eat, given that modern agriculture has taken homo sapiens far afield from our hunter-gatherer days. But it doesn’t necessarily follow that test tube nutrition is better than food, and at this point, I’d still take my chances with food, from a nutritional as well as a social standpoint. I can imagine is a society where people who rely on government assistance (either SNAP, the Supplemental Nutrition Assistance Program, or WIC, the special supplemental foods program for women, infants, and children) must receive all or some portion of that assistance in the form of test tube nutrition. It would be an economical solution, and people would be assured of receiving better nutrition than a diet consisting primarily of highly processed food products. With better nutrition, long-term savings in medical costs should also accrue. However, we would also create a society with a pool of second-class citizens who couldn’t afford food and a privileged minority who could. An historical parallel can be seen in the promotion of potatoes in Europe as a cheap, nutritionally complete source of nutrition for peasants and laborers. This population was thought to require nutrition and not pleasure, reinforcing class distinctions. I’m really uncomfortable with creating a class-based entitlement of this sort. And when the potato blight hit northern Europe in the 1840s, the effects were catastrophic and long lasting. What would happen if there was a shortage of a key ingredient in a test tube nutrition product? If meals are consigned to leisure time events, akin to hobbies, fewer people than ever will cook. The makers of Soylent argue that what they term “leisure meals” can still be part of our culture, but if people don’t cook their day-to-day meals, they won’t learn the skills to cook, much less to make high-stakes special-occasion meals. Food will become another area where the overwhelming majority of people simply consume products rather than create them, like making clothes, furniture, toys, music, or art. We each answer the question of what is the right balance of consumption versus production, but at the very least, I think we should make our choices in a thoughtful way instead of simply grasping at what appears to be a convenient solution to a difficult problem. Another troubling issue is that test tube nutrition is yet another step away from something essentially vital — in all the meanings of the word: of or pertaining to life, having remarkable energy or force of personality, being necessary for or a source of life, indispensable. I don’t know whether our bodies and our spirits can be so easily compartmentalized, so that the needs of one can be met without regard to the other. If eating is a sensual act, maybe that makes test tube nutrition a sense-less act. Over the long haul, our spirits may suffer from such a mechanical idea of nutrition. After all, our bodies aren’t cars. We’re not just refueling our bodies at meal times; we’re also engaging our senses in ways that help us to center ourselves and reconnect us to our communities. When the DD was a toddler, for example, she could never simply start playing with her friends. She had to share a snack with them before she felt comfortable enough to play with them. Sharing food with her friends is still an important way for them to bond. Nowadays, instead of preparing meals and sharing them with our families, too often I hear that it’s necessary to schedule Mommy-and-me or Daddy-and-me dates, sign up for social skills and etiquette classes for kids, or hire social managers for adults. Perhaps people, being the endlessly inventive creatures that we are, will create other products to replace the sensual enjoyment of eating and new activities for structuring our social time. We need to have a better understanding of the relationship between overscheduled lives, frayed social relationships, and the devaluation of meals. Writing this post reminded me that an important component of meals is the pleasure and satisfaction that I get from preparing food and eating it. There’s something essentially human about that. When I’m “too busy” to cook or eat, it usually isn’t because I’m doing something else that brings me deep joy or fulfillment. More often than not, it’s just busywork. In this day and age, we need to make conscious choices for doing things that contribute positively to our lives. If using test tube nutrition gave me an opportunity for that, then I’d be for it. Otherwise, I’ll pass. How about you? Do you see test tube nutrition becoming a part of your daily routine? This entry was posted in Musings on July 5, 2014 by sandra.